Sale? Special? Discount? Closeout? Wholesale? 50% off Carpet? 50% off Padding? 50% off Installation? At Portland Flooring & Carpet of Oregon City we beat our competitor’s 50/50/50 and similar competitor deals day in day out. We provide unbeatable discount carpet and discount flooring throughout the entire Oregon City, Portland and Vancouver area. Buy real quality carpet by Shaw Industries at Portland Flooring & Carpet of Oregon City. We bring the Carpet Store to You. Call us at (503)775-7617 or fill out our online form to set up a complimentary estimate and design consultation. Small Job? Carpet Remnants Can’t be Beat! Find a Bargain! Carpets from Shaw, Mohawk and Kraus carpet mills to name a few. Remnants are offered not just at a discount but at many cases truly below wholesale. Carpets for your living room, family room, bedroom etc. Come see if we have the remnant that’s right for you. Come in today and save! Bargains! Can we compete with the box stores? The question is ‘can they compete with us?’ Not only do we beat them in price but they can’t match us for speed of delivery and installation. At Portland Flooring & Carpet of Oregon City we have trucks running every day, and can have special order delivery and installation, normally within 48 to 72 hours. You can visit Portland Flooring & Carpet of Oregon City’s Discount Carpet Center at 3452 NW Yeon Ave in Portland, Call us at (503)451-5353 or fill out our online form to set up a complimentary estimate and design consultation. 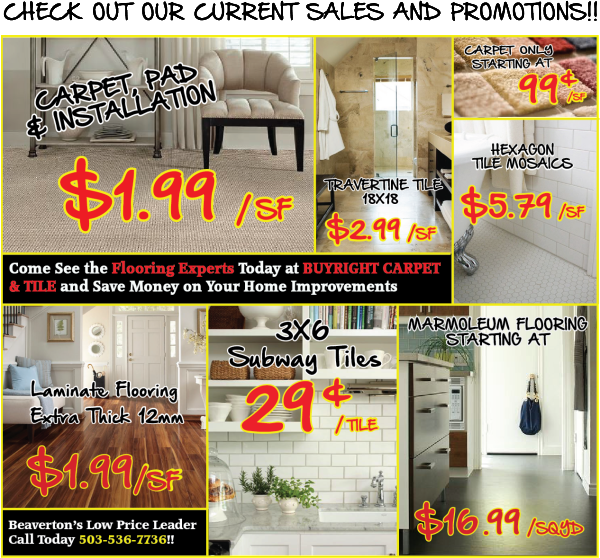 Portland Flooring & Carpet of Oregon City is your source for Oregon City Discount Carpet. Call Now (503)451-5353 for a Complimentary in Home Design Consultation.